In our Chartering business unit, we aim to capture new business opportunities in the shipping industry. We leverage on our managed vessels, and capitalise on our strong insight and expertise. We focus on supramax bulk carrier sector, and provide excellent first class services according to our customers business demand. 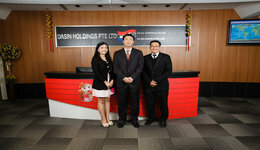 Dasin has been in the shipping industry over many years. Through these, we have established very solid working relationship with industry player in the shipbuilding, marine transport, major charterer businesses, as well cargo owners. As our Clients expect smooth operation and optimum costing, our relevant departments are on constant contact with vessels and other parties to ensure safe and smooth operations, and to meet our strict Clients’ expectations.